Hey sports fans, how about a thread just for college game used items? We have a NFL section so why not a college section? I'll start off with a vintage 1970's Georgia Bulldogs game worn helmet that I picked up within the past few Months. The seller was a tad-off on his dates and I edited some of the email because of some private and/or personal comments. His email gives us a little insight on how UGA prepared for opposing teams. When I got the helmet, it was absent a two-bar facemask and thanks to Curtis at the Helmet Hut, he was able to provide me with a replacement facemask that seems to compliment the helmet very well. Written inside the helmet is the #88. I haven't a clue who may have owned the helmet but any information would be appreciated. I'll give you a little background on the helmet. Its an old (60's) helmet from the University of Georgia. The reason it has the Alabama style numbers on the sides is that it was last used in practice to simulate an Alabama player. UGA like most colleges, has the scout team (B-team) run the next opponent's offence and defense against the Georgia offence and defense. I don't know if number 32 was an Alabama offensive or defensive player, but he was someone that the Georgia players were keying on. I played for UGA 67 thru 70. I acquired the helmet as the result of a charity/old-timers football game in about 1976. The UGA Athletic Department donated some old equipment for the game. My 1977 Michigan Wolverines game used helmet. It was used by All American center, Walt Downing. Robert provided me with a photo match. Speaking of Michigan State, I just picked up a late 1960 Michigan State jacket made by King O'Shea. I have a ton so I'll post my favorite and you can click on my sig to see the rest. 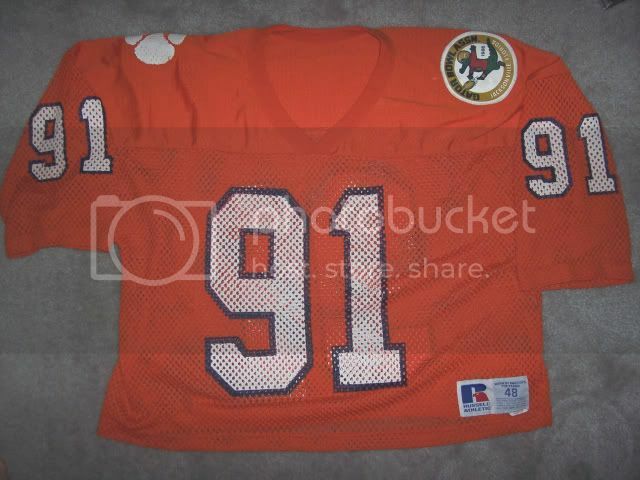 You can see my entire Clemson Tigers collection here with over 30 items. Just picked up a awesome Donta Jones Nebraska helmet from the 1994 season. On the back of the helmet, there is a College Football 125th Anniversary sticker which dates the helmet to 1994. In 1994, Nebraska won the National Championship. Donta Jones was elected to the Nebraska HOF in 2007. It's a Bike helmet with unbelievable wear. 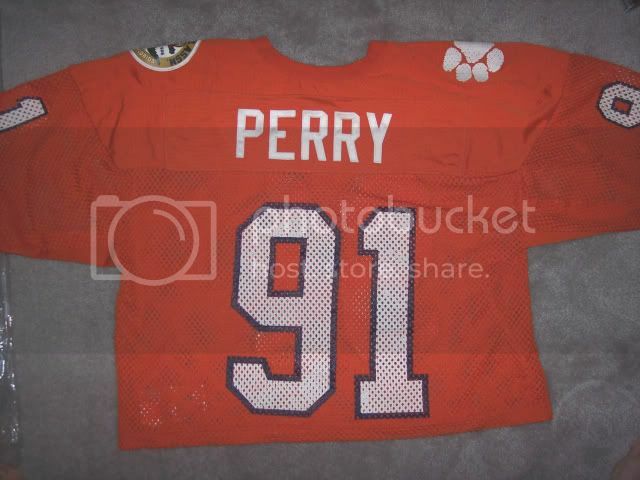 All of my football stuff is here: www.hoosfootball.com/My_Collection/UVA_GameUsed_PracticeUsed.html. I have a lot of baseball, basketball, soccer and lax stuff as well, but no photos yet. All used in the 1920's and sidewritten. Always looking for vintage game used bats of Houston Buffs and Colt .45's players.